Astander, a global leader in ship repair and conver- sion, for his insights on the market today. Please share with us your view on ‘the market’ today. 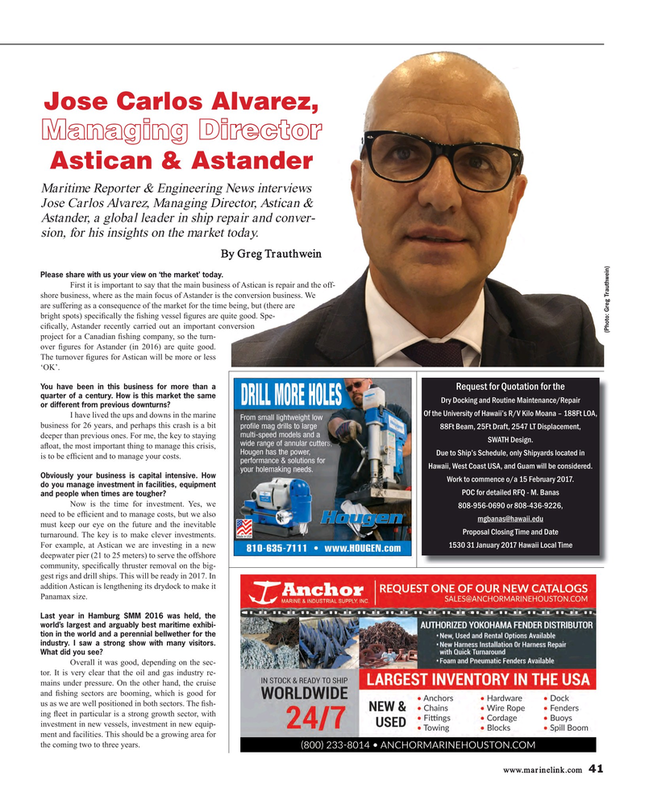 First it is important to say that the main business of Astican is repair and the off-of Astican is repair and the off- shore business, where as the main focus of Astander is the conversion business. We e conversion business. We being, but (there are are suffering as a consequence of the market for the time being, but (there are bright spots) speci? cally the ? shing vessel ? gures are quite good. Spe-te good. Spe- ci? cally, Astander recently carried out an important conversion version (Photo: Greg Trauthwein) project for a Canadian ? shing company, so the turn- over ? gures for Astander (in 2016) are quite good. The turnover ? gures for Astican will be more or less ‘OK’. Dry Docking and Routine Maintenance/Repair or different from previous downturns? Due to Ship’s Schedule, only Shipyards located in is to be ef? cient and to manage your costs. Hawaii, West Coast USA, and Guam will be considered. POC for detailed RFQ - M. Banas and people when times are tougher? Proposal Closing Time and Date turnaround. The key is to make clever investments. Last year in Hamburg SMM 2016 was held, the world’s largest and arguably best maritime exhibi- tion in the world and a perennial bellwether for the industry. I saw a strong show with many visitors. Overall it was good, depending on the sec- tor. It is very clear that the oil and gas industry re- mains under pressure. On the other hand, the cruise and ? shing sectors are booming, which is good for us as we are well positioned in both sectors. The ? sh- ing ? eet in particular is a strong growth sector, with investment in new vessels, investment in new equip- ment and facilities. This should be a growing area for the coming two to three years.